Look: A visual inspection of the wine under neutral lighting. Check out the color, opacity, and viscosity (wine legs). 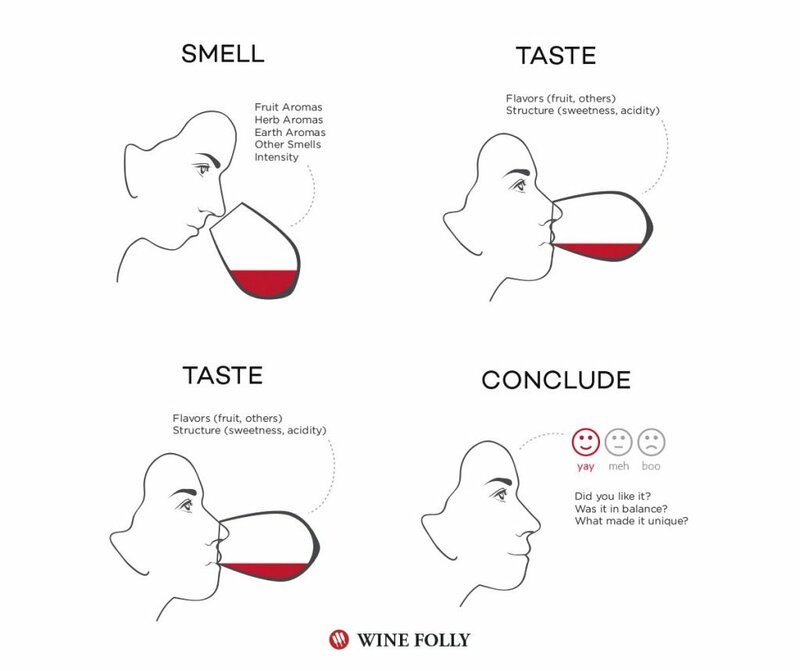 Smell: A wine’s aroma is an excellent indicator of its quality and unique characteristics. Swirl your glass for a solid 10-12 second (this helps vaporize some of the wine’s alcohol and release more of its natural aromas) and then take a quick whiff to gain a first impression. Now stick your nose down into the glass and take a deep inhale through your nose. What are your second impressions? Do you smell oak, berry, flowers, vanilla or citrus? Taste: Finally, take a taste. Start with a small sip and let it roll around your mouth. Our tongues can detect salty, sour, sweet, or bitter. All wines are going to have some sour, because grapes all inherently have some acid. Your tongue can also “touch” the wine and perceive its texture. Ethanol gives a wine texture because we perceive it as “richer” than water. We also can detect tannins with our tongue, which are that sand-paper or tongue-depressor drying sensation in red wines. You can also check how long the flavor impression lasts after it is swallowed. Does the taste persist or is it short-lived? Think/Conclude: Develop a complete profile of a wine that can be stored in your long term memory. Did the wine taste balanced or out of balance (i.e. too acidic, too alcoholic, too tannic)? Or simply: Did you like the wine? After all there’s no right way or wrong way to taste wine. It’s this simple — do you like what you’re drinking or do you not like what you’re drinking?